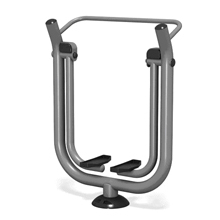 Outdoor Exercise Equipment - Best Litter Receptacles Inc.
Click a photo for more details on that specific outdoor exercise equipment. 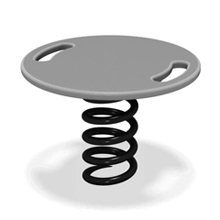 The Leg Extension has an isokinetic spring resistance coil that is activated to provide strength fitness. 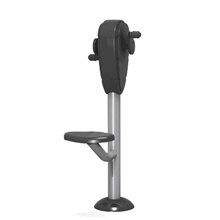 The Leg Press offers benefits similar to leg lifts and lower body strength building. 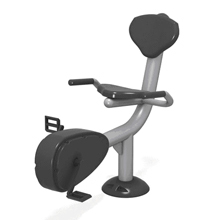 The Recumbent Cycle utilizes magnetic resistance bearings to provide a smooth gliding cycling resistance while pedaling the stationary bike. The Sit-Up/Back Extension is a dual ab exercise machine. 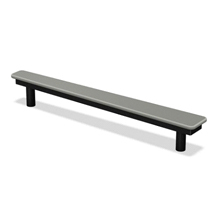 The Sit-Up bench has perforations for air flow providing comfort and quick drainage after rain. 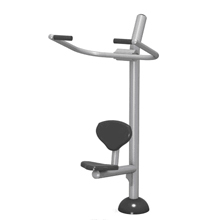 Lat Pull Down users grip handles and pull downward in a controlled manner engaging numerous upper body and core muscle groups. The isokinetic spring resistance creates a higher level fitness experience for the user in the outdoor fitness environment. The Hand Cycle is a comfortable solution for building aerobic fitness. 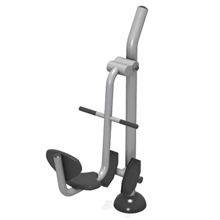 The Hand Cycle utilizes magnetic resistance bearings offer a smooth, continuous resistance. 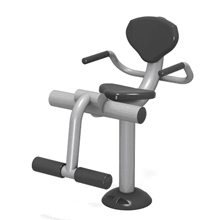 Chest Press users sit on the ergonomically designed saddle and push the non-slip handles outward. Isokinetic springs activate to provide smooth resistance and workout targeted strength training zones. The Elliptical strengthens upper body and lower body muscles and provides cardio and muscular endurance benefits. Cardio Walker users stand upright and alternate their legs in a striding, smooth motion. Targets all four elements of fitness including aerobic, muscle, and core fitness, and balance/flexibility to enhance endurance and strength. 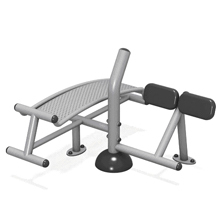 This component is similar to indoor gym equipment like aerobic steps and boxes for jumping onto. 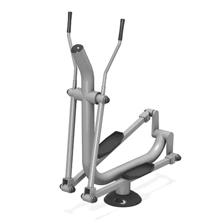 It is highly flexible and serves for cardio jumping and step ups as well as strength training like push-ups and dips. 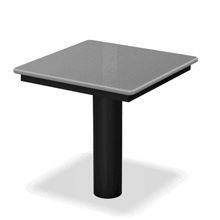 The top surface is made from high quality marine-grade plastics. It is available in several heights to meet site-specific and user needs. These boxes are often grouped together to offer multiple step heights for various levels of challenge. 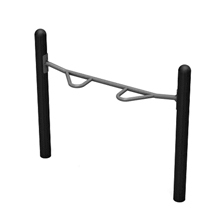 Height: 6", 12", 18", 24"
This unique push-up bar can be installed at two different heights and offers a curved bar for different push-up hand positions that target various muscle groups such as the biceps. Install two Push-Up Stations at different heights together to offer various levels of challenge in your Outdoor Fitness Park. The Horizontal Chin-Up offers many of the benefits of traditional Chin-Ups but also allows the user to balance his or her feet on the platform, thus enabling the individual to control the amount of body weight he or she is lifting with the arms. This component utilizes the Plyometric Box as the platform and thus offers the additional fitness benefits of the Plyometric Box -two exercises in one- for step ups, dips, and balance exercises. 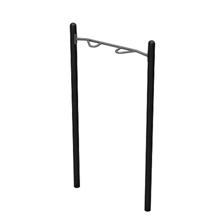 The traditional Chin-Up Station is an excellent addition to any Outdoor Fitness Park or Trail. Users will be encouraged to utilize this component rather than building structures or landscaping elements for exercise activities, thus helping preserve the site. This product has a uniquely curved hand grip to target various muscle groups. 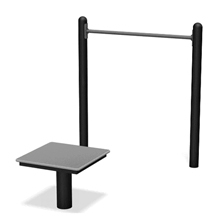 The Chin-Up station can be installed at various heights to provide an alternative accessible version for individuals who use mobility devices. The compact Balance Plank offers a narrow walking area that tapers from 6 to 3 for a graduated challenge. Users can test their balance by walking from one end to the other, practicing jumps and switching directions, as well as providing a challenging base for standing yoga poses. The Balance Plank also serves as a convenient push-up platform for elevated push-ups for multiple users simultaneously. The Balance Board packs a punch in a small space. The spring base offers an added challenge as muscles work to react to completing familiar exercises in a new context. 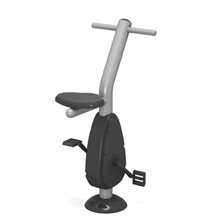 The board wobbles and flexes as the user attempts standing squats, single leg lifts, or even push ups. 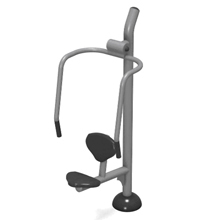 The convenient handles routed into the surface provide comfortable grips for arm exercises like push ups and dips. This truly is a full body gym in a small package. Designed to emulate the benefits of a stability fitness ball.